An independent peer review panel found the NMFS findings are backed by “comprehensive analyses, new data, and modeling,” according to a statement from the Golden Gate Salmon Association (GGSA). The panel further found NMFS used the “best available science” and produced evidence of “significant adverse impacts” to species and critical habitat, including unacceptable harm to salmon. “The NMFS science and the peer review both make clear the current twin tunnels proposal will likely drive the salmon to extinction and will harm other wildlife. GGSA has no option but to oppose this project,” said John McManus, GGSA executive director. • The heavy flow through the fish screens at the giant water intakes in the Sacramento River, located just downstream of Sacramento, could impinge the juvenile salmon to the screens where they will perish. • Those that survive impingement and are stressed or injured will be subject to heavy predation. • The Sacramento River below the screens will be reduced to a relative trickle. The tiny salmon need strong flows to push them downstream. Without that, more predation and heavy losses will result. • Lower flows downstream of the intakes will cause more juvenile salmon lost to the interior Delta through the Delta Cross Channel and Georgiana Slough. • A major decrease of freshwater downstream of the intakes will also highly degrade water quality, resulting in increased contaminants and decreased food sources. 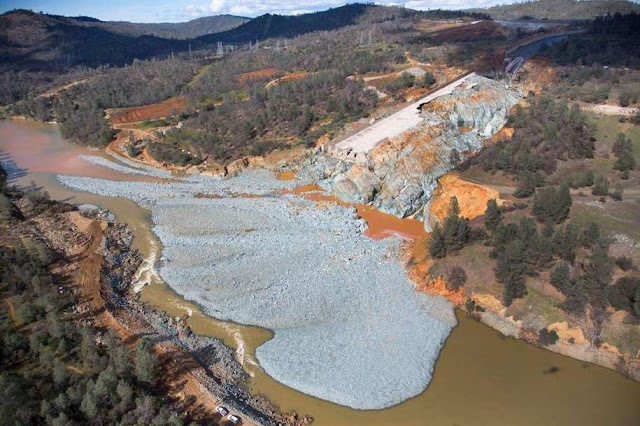 NMFS scientists forecast increases in winter run Chinook redd (nest) dewatering (page 78) and spring run Chinook redd (nest) dewatering (page 86) on the Sacramento River if the tunnels are built. • Salmon egg and alevin mortality on the American River under the tunnels project “clearly” results in adverse effects on fall run salmon, the mainstay of the sport and commercial fishing industries. • Increased loss of federally protected winter and spring run salmon will occur from dewatering of their incubating eggs in upstream river gravels. The Governor continues to promote his tunnels as recreational, commercial and Tribal fishermen face reduced ocean and inland salmon seasons this year. Pre-season numbers unveiled by Dr. Michael O’Farrell of the National Marine Fisheries Service at a meeting in Santa Rosa on March 1 estimate only 230,700 Sacramento River fall run Chinook adults and 54,200 Klamath River fall run adults will be in the ocean this year. Both forecasts are lower than those of recent years, with the forecast for Klamath fall run being among the lowest on record. Ocean regulatory management for salmon fisheries on the ocean from Cape Falcon in Oregon to the Mexico-US Border is heavily based on these runs. The Delta Tunnels will also have a huge detrimental impact on Delta smelt, a state and federally listed endangered species, including reducing the available habit for smelt, migration, spawning and rearing. Delta smelt, longfin smelt and other fish species continue to remain at the edge of extinction. The Delta smelt has not yet become extinct, but the numbers of fish collected in the fall 2016 midwater trawl survey conducted by the California Department of Fish and Wildlife (CDFW) remained alarmingly low. This is in spite of improved precipitation last winter and spring, followed by a very wet fall that should have resulted in much higher numbers of smelt surviving. While Governor Jerry Brown and other state officials proclaim that the Delta Tunnels project will “restore” the Delta ecosystem, they revealed their real plans when the administration applied for a permit to kill winter-run Chinook salmon, Central Valley steelhead, Delta and longfin smelt and other endangered species with the project. On October 7, 2016, California Department of Water Resources (DWR) submitted an “incidental take” application for the California Department of Fish and Wildlife (CDFW) in “compliance” with the California Endangered Species Act (CESA) in order to build the Delta Tunnels. The NMFS draft biological opinion confirms and expands upon what previous scientific reviews of the Delta Tunnels project, including a scathing 43-page report by the U.S. EPA in August 2014, have already documented - that the project, rather than restore the ecosystem, is likely to harm water quality and further imperil struggling populations of salmon, steelhead and other fish species in Central Valley rivers, the San Francisco Bay-Delta and the ocean. The Delta Tunnels project is based on the absurd assumption that diverting more water out of a river and estuary will somehow “restore” that river and estuary. In addition to hastening the extinction of Sacramento River Chinook salmon, Central Valley steelhead, Delta and longfin smelt and green sturgeon, the California WaterFix also threatens already imperiled salmon and steelhead on the Trinity and Klamath rivers.